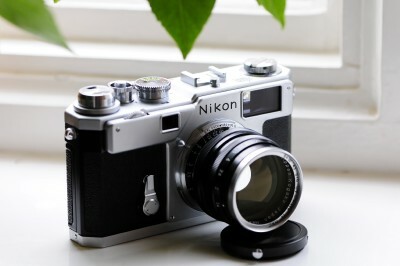 The Nikon S3 2000 Limited Edition is a reproduction of the original S3 rangefinder introduced in 1958. The astonishing thing is that one can buy this camera new even today - it is like being able to go back 50 years and hold a camera of that time in your hands, only the camera is brand new. Nikon made the S3 2000 Limited Edition between 2000 and 2001. Due to the high price, the camera did not sell very well. I believe prices were dropped by Nikon at some point. Despite this, some retailers still have brand new stock remaining. There are surprisingly few reviews of this camera. This is perhaps because most people who buy this camera do not use it, for fear that it will reduce the camera's resale value. So most examples are left in the box, or displayed as jewellery. The first thing that strikes one is the way the focusing is handled. The Nikon S3 has a small wheel on the top right hand side of the camera. Just behind this wheel is a small lever. The lens gets locked at the infinity setting, and you need to push the small lever down in order to release the lock, so that you can focus at distances closer than infinity. Unlike a Leica camera, the whole lens rotates; there is no focusing ring on the lens (I am talking about the internal mount 50mm f1.4 lens that is supplied with the S3). The confusing bit for me is that the aperture ring is where I normally expect the focusing ring to be, and the aperture ring is quite easy to turn, so I almost always inadvertently change the aperture setting when I am really trying to just focus. I suspect that this is just a matter of getting used to the way the S3 works. You can focus either by turning the small wheel or by rotating the entire lens, provided you have unlocked the lens from the infinity setting. If you take the lens to infinity, there is a click and the lens locks at that position. I find that using the wheel is harder as it has more resistance, whereas the lens itself can be rotated more easily. The advantage of the wheel is that one can manipulate it by a finger - which makes it possible to operate the camera by one hand. Still, I prefer to rotate the lens itself. For a new camera, there is a surprising issue - while focusing the lens, one hears a squeaking noise, emanating from the focus mechanism inside the camera, as the lens is turned. In my example, this happens at the closer focusing distance. I understand that the squeaking noise is pretty common in the S3 2000 - I wonder if this is because these cameras haven't seen much use, or if it is a defect in manufacturing. In any case, from reading various posts at www.rangefinderforum.com, I gather this is not unusual. One used to the smooth focusing action of a Leica M6 will perhaps be a bit surprised by this issue, especially as the Nikon S3 2000 is quite an expensive camera. There is a view that Nikon S3 cameras have a poorer rangefinder than say the Leica M series or the Cosina Voigtlander series. I find this to be untrue; the truth is somewhat more involved. Firstly the S3 has a 1:1 viewfinder, so the view is more magnified than the M6. I find the viewfinder brightness to be no different than the M6. What I suspect gives the impression that S3 is harder to focus, is that you cannot see the outline of the rangefinder patch - in my case, because I wear glasses, I don't see a patch at all, but a vague orange blob at the centre. So this gives the impression that the S3 rangefinder is inferior to that of the M6. In reality though, I find that the S3 rangefinder is pretty good, in that it is more accurate than the M6. This is because the rangefinder patch is more magnified, and the effective rangefinder base of the S3 is longer than the M6 (I use the .72x version of M6). Also the focusing action of the Nikon is more precise, as the lens has a longer throw. The net result in my view is that the M6 is faster to focus, as the rangefinder patch is a well defined rectangle in the centre, and the lens throw is quite small, but the S3 is more precise, and one can fine tune the focus in the S3 more than you can with the M6. It would be interesting to test focusing very fast lenses on the S3 and compare the accuracy of the focusing action against the M6. The S3 2000 limited edition has a rubberised cloth shutter curtain. As a result the shutter is quiet and only very slightly louder than the M6. The winding action on the M6 appears smoother, the S3 is somewhat tighter; but this could simply be because the M6 is well used, whereas the S3 had laid unused for nearly 10 years. As the S3 is used more, it may become smoother. I am somewhat surprised that the Nikon S3 and SP limited editions have such poor sales. Given that it is almost impossible to get near mint original S3/SP cameras, I would have thought that the reissues would sell like hot cakes. Perhaps it is the high cost that is the inhibitor. As I use the S3 and take some actual photos (I need a light meter to help me out) I will report on the quality of images. Most of my experience is with SLRs, the only other rangefinders I have tried are the Leica CL and M6. So my experience with rangefinders is quite limited. Compared to the Leica M6, the S3 appears less refined, especially the mount and the focusing mechanism seem unnecessarily complicated. I imagine that if Nikon had continued with the rangefinder line, they would have changed the lens mount at some point. As it stands, time has forever stopped for the S3.